Eric Gray at www.vcritical.com blogged today about the benefits of using a flash based device, like an SD card, for loading VMware ESXi, so I thought I would take a few minutes to touch on the topic. HP curre ntly offers these SD slots in their BL460 G6 and BL490 G6 blade servers. 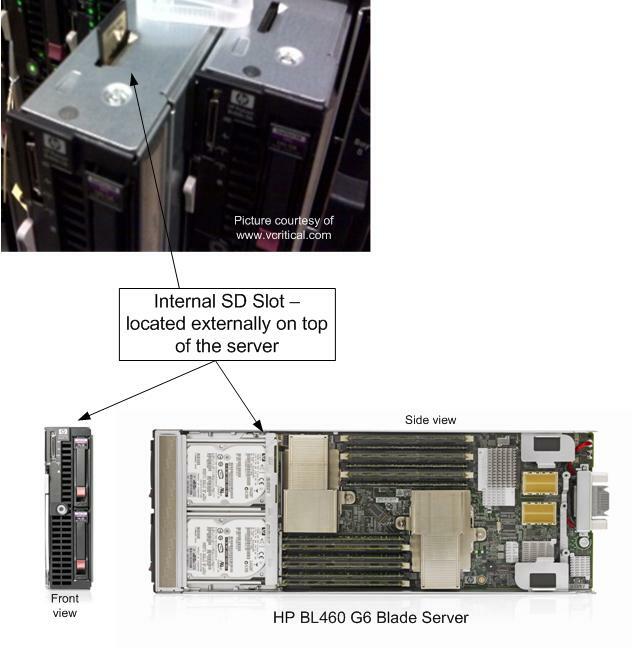 As you can see from the picture on the left (thanks again to Eric at vCritical.com) HP allows for you to access the SD slot from the top of the blade server. This makes it fairly convenient to access, although once the image is installed on the SD card, it’s probably not ever coming out. HP’s QuickSpecs for the BL460 G6 state offer up an “HP 4GB SD Flash Media” that has a current list price of $70, however I have been unable to find any documentation that says you MUST use this SD card, so if you want to try and use it with your own personal SD card first, good luck. It is important to note that HP does not currently offer VMware ESXi, or any other virtualization vendor’s software, pre-installed on an SD card, unlike Dell. Dell has been offering SD slots on select servers for quite a while. In fact, I can remember seeing it at VMworld 2008. Everyone else was showing “embedded hypervisors” on USB keys while Dell was using an SD card. I don’t know that I have a personal preference of USB vs SD, but the point is that Dell was ahead of the game on this one. 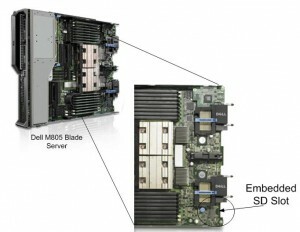 Dell chose to place the SD slots on the bottom rear of their blade servers. I’m not sure I agree with the placement, because if you needed to access the card, for whatever reason, you have to pull the server completely out of the chassis to service. It’s a small thing, but it adds time and complexity to the serviceability of the server. 1/13/2010 UPDATE –SD slots are also available on the BL 280G6 and BL 685 G6.